The home automation we define as the set of systems capable of automating a home, providing energy management services, safety, welfare and communication, and canbe integrated through networks of internal and external communication, wired or wireless, and whose control has certain ubiquity, from within and outside the home.Could be described as laintegración of technology in the intelligent design of an enclosure. At B&BTECNOGROUP today to consider the automation gives us the possibility of unifying all systems (CCTV, video security, ict, etc ...) wisely. With this control, get plenty of amenities and advantages. 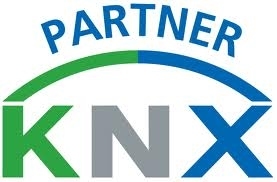 Our team works under the KNX system is formed as a standard at European leveland is compatible with over 100 brands. This system offers great advantages ininstallation versatility, large range of extensions and enhances the security of the facility. This system is decentralized and feeds on the communication channel. With this we can have our whole house controlled from our Iphone, iphone, pc or tveven if we are out of our home.